Sometimes a dash of nostalgia can be a breath of fresh air in the videogame industry, and that’s exactly what Rad Raygun is. The monochrome look, the Mega Man gameplay and the ridiculous story all come together perfectly allowing gamers to reminisce on the olden days. Nostalgia is typically a fleeting feeling that starts off strong but eventually gets, well, old. Luckily for Rad Raygun that feeling is supplemented by the game’s great sense of humor and absolutely astounding soundtrack. The first thing you see when you boot up Rad Raygun is its Gameboy styled menu screen, and what a rush of nostalgia that brings. The entire game is covered in a monochrome art style that includes the colors green, green, green and green. This gives Rad Raygun a look that feels new even though it’s clearly something quite old. The character design is reminiscent of the 80s and 90s era of enemies with some extra humor thrown in. Level design is simple but effective as each level conveys a sense of change and gives the sense that you’re definitely in a new locale. Some levels, I’m looking at you Tetris level, are more daring than others and while they don’t always pay off it’s nice to see the attempt. The story in Rad Raygun is as simple, and nostalgic, as one can get. You’re told it’s the year “198X”, that “No one can defeat the Soviet Union” and honestly, do you need a better setup than that? At no point does Rad Raygun take itself seriously as you hop from decade to decade taking down soviet enemies and saving the world. Rad himself is a robot created to fight the Soviets and bring back order to the world. His main weapon is a canon attached to his arm and he aims to one day take down that villainous Dr. Wily (whoops, wrong game). It comes as no surprise that a game based on the nostalgia of old-school side scrolling games, with a robot as the main character, would choose to borrow from Mega Man. As Rad overcomes more obstacles he unlocks new powers that include a jetpack, a grenade launcher, and a sweet back-dash. Each power helps to increase the depth of the gameplay and add some new tricks to Rad’s arsenal. All of these powers also help Rad to fight the incoming onslaught of Soviet forces, including some dastardly bosses. At the end of each of the five stages Rad is pit up against a boss. While I had some trouble on two particular bosses at first I quickly realized there were ways to end the fights rather quickly. Typically your newest asset or power is the main way to crush a boss and, sadly, take them out rather quickly. Even the final boss, who has an awesome buildup throughout the game, is easily defeated with some quick thinking and button mashing. It’s unfortunate that the bosses aren’t tougher as their character design and cheesy dialogue make for some of the best parts of Rad Raygun. I suppose that is my fault for assuming a difficult game when I saw the Mega Man style of gameplay but making an easy Mega Man game is just sacrilegious. I can’t be too mad though, it’s more the experience of the game as a whole that had me so giddy I almost forgot about the bosses entirely. The conversations between Rad and his government handlers are laugh out loud funny and some of the pop-culture references are really spot on. Self referential humor doesn’t always work but Rad Raygun slips the humor in subtly and makes it completely viable. Rad often questions the world around him and the responses from his handler are usually pretty funny in return. Boss’ also have great dialogue with Rad as they all seem to know they’re in a videogame but are powerless to change that fact. It’s a great feature of Rad Raygun and often times I’d be blasting through levels waiting for another dialogue scene, dialogue is easily Rad’s second best feature. Rad Raygun’s absolute best feature has to be its music. My goodness, talk about a soundtrack that gets the time period right while also conveying each level’s intent to the player with nothing but old-school CPU noises and chip-tune-like beeps and chirps. Fantomenk, the source behind the score, does a fantastic job of bringing the old-school style of music back to life in Rad Raygun. Normally a game would need to have other great qualities other than a soundtrack for me to recommend but the soundtrack here is good enough to warrant a playthrough just to hear it, it’s that good! If the monochrome look brings you back to a time where games only had two buttons then the soundtrack will make sure you stay in that nostalgic nirvana just a while longer. Great soundtrack, solid gameplay, fun graphics and some silly dialogue make for a great experience but surely something must be wrong, right? Yes, sadly Rad Raygun is only a couple of hours long and while it left me wanting so much more I also felt like the game needed more to offer. The new powers were fun, the bosses were clever in design, and everything else clicked but I just felt like it ended too soon. 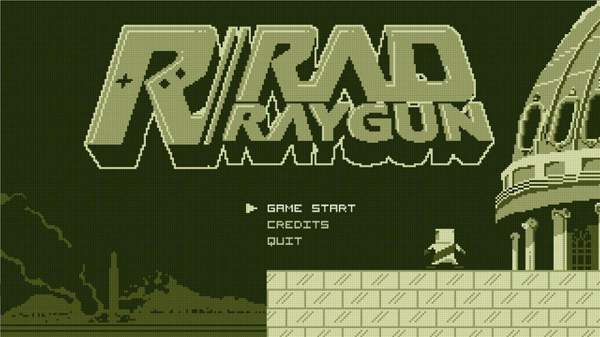 Obviously games made by so few people are tough to crank out and making a shorter game makes it easier to finish but Rad Raygun and his delicious soundtrack deserve more. I honestly can’t rave enough about the soundtrack in Rad Raygun so instead of listening to me go and play the game and listen to it. The gameplay feels like riding an old bike, the soundtrack is killer, the dialogue will make you laugh and the graphics will make you remember the good old days. Rad Raygun is short and sweet, and I really hope there is more to come in the future. Completing each level in the fastest time or with the highest score will keep some playing this game for a good long time while trying to figure out what path is the fastest or most efficient. It's cheap, it looks good, and it plays well, if you've got $5 and a few hours to kill you really can't go wrong with Mercury Hg. The Way of the Dogg. While the music is great and the story has potential, this game falls on its face with bad design choices and some frustrating gameplay. Do yourself a favor and just buy an old Snoop album for $10 on Amazon.